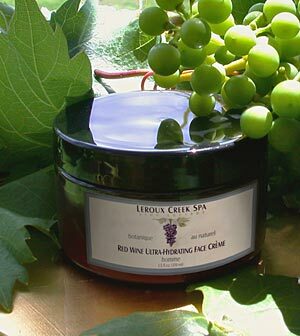 This daily moisturizer combines the powerful antioxidant agents found in grape seed oil with our Chambourin red wine. Deep nourishing crème is specially formulated to enrich, hydrate and protect even the most sensitive skin. Rich, face-firming formula works to counteract the signs of aging. Rejuvenates and replenishes with the powerful antioxidant agents found in grape seed oil. Excellent as a daily moisturizer in dry climates and as a night cream in humid climates. Ingredients: Distilled Water, Red Wine, Grape Seed Oil, Aloe Gel, Coconut Oil, Sunﬂower Oil, Jojoba Oil, Vegetable E-wax, Silk Protein, Boric Acid, Potassium Sorbate, Zinc Oxide, Titanium Oxide.